Samantha had already worked 50 hours and it was only Thursday. She had sent emails at 3:00 in the morning one night and her phone starts buzzing around 6:00 am while she’s at the gym. By the time I saw her on Saturday, she was both mentally and physically exhausted; she knew something had to change. I recognized this scenario myself and it felt all too familiar. That was me just a few short years ago. When I was striving for the next promotion in my corporate position and pushing myself to meet my own (very high) expectations. I believed that the harder I worked, the more I could achieve. I thought that the more I achieved, the more valuable I was as a person. And I somehow assumed that my value needed constant deposits to remain worthy. This was my own special form of self-abuse. But I know I’m not alone. We don’t have to earn our value or worthiness. The mere fact that we are still breathing means there’s something here for us to do or give or receive. And more than likely, that thing has absolutely nothing to do with that report that has to get written, that project gap that needs filled or that review that should have been completed weeks ago. Many times I will ask my coaching clients to make a Joy List. This is a list of 50 things that bring them pure pleasure and delight. It’s the things that make them smile, make them feel really happy and the things they’re doing when they tend to lose track of time. Reading a great book, writing about things that I care about, watching my niece play basketball. Snuggling up on the sofa with my husband to watch one of our favorite movies. 1. The things that bring us the most pleasure rarely cost very much. 2. 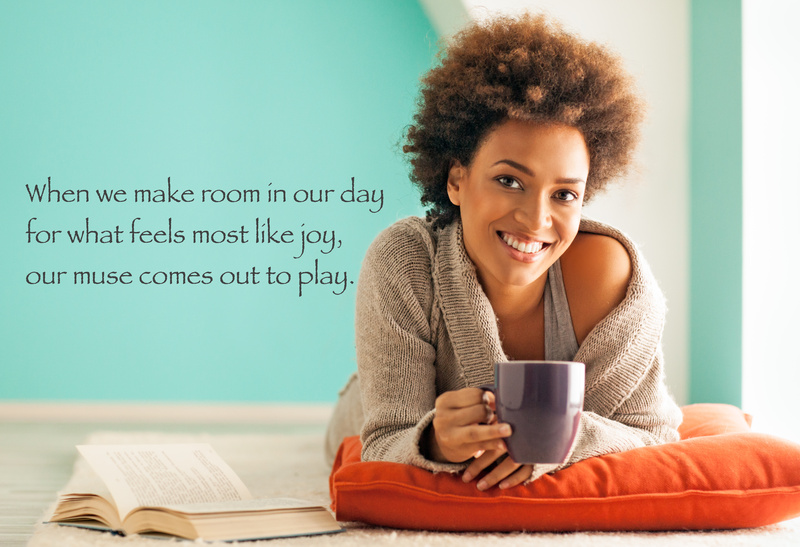 When I’m making room for what feels like joy in my day is when my muse comes out to play. It’s when I’m doing things that bring me joy that I get my best ideas. It’s when I’m not pushing so hard to make things happen that many things fall right into place, exactly as they should. I have never once gotten a great idea for my business while I was sitting in my office, at my desk, behind my laptop. Make your list of 50 (yes, 50). Then, make room in your day for joy – every day. Make time to lose track of time. Make space in your heart and mind for your muse to come out and play.